If you are traveling to Italy's capital city during the holiday season, there are plenty of festivals and events that happen each December. However, although winter can be quite rainy in Rome, it can also be quite cold at night, so you should prepare for your trip by packing plenty of layers and warm clothing. That way, you can enjoy the many seasonal celebrations taking place throughout the month across the city. Daytime temperatures in December stay around the mid-50s Fahrenheit, with many days of the month receiving quite a bit of sun. However, nighttime temperatures in Rome can drop to around freezing temperatures. Overall, the average high in December is 54 degrees while the average low bottoms out at around 41 degrees Fahrenheit. Winter is the second rainiest season behind autumn, and in December, Rome can average nine days of rainfall and a total accumulation of around four inches of precipitation throughout the month. December can also mean you'll still experience a bit of the nice autumnal weather, but the weather shifts between cloudy periods accompanied by wind, rain, and milder temperatures generated by southern winds and cold and sunny days brought by the wind from the north, known as the Tramontana. Frost and snow are both a rare phenomenon in the city, but you may experience it in the country right outside the city. However, heavy snowfalls have happened several times in December throughout the city's history, so you should be prepared for any weather condition if you're visiting this month. When it comes to preparing for your trip to Rome, you'll need to bring plenty of layers of warm clothes to stave off the nightly chills while staying comfortable during the moderately warmer days. Be sure to pack a heavy jacket, plenty of sweaters, long- and short-sleeved shirts, and pants for your trip to adequately prepare for any temperature fluctuations you might experience. You may also want to pack a raincoat, umbrella, and waterproof shoes since December can get quite wet. 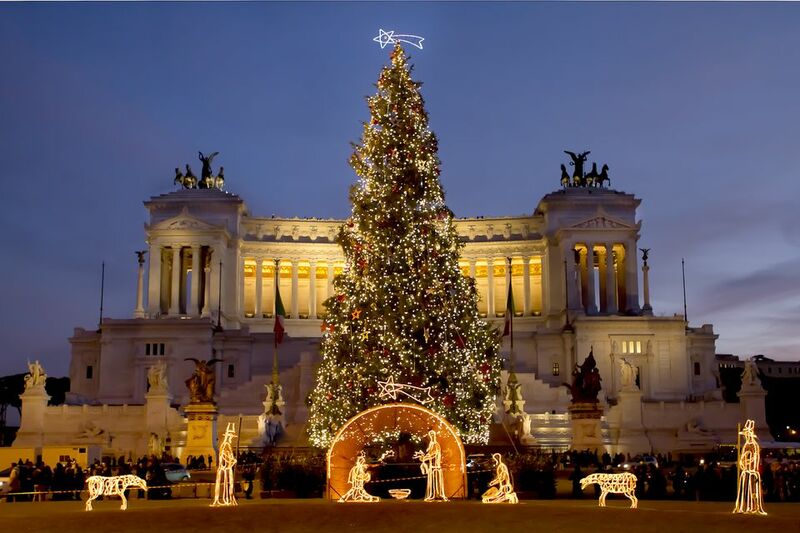 Holidays in Rome in December, while mostly Roman Catholic and Christian, also include Jewish and secular events. Throughout the month, you'll find a variety of different holiday markets, religious celebrations, and even a few parties. Hanukkah: During Hanukkah, Rome's large Jewish community gathers in Piazza Barberini where candles on a large Menorah are lit each evening during the eight-night holiday. The area near Campo dei Fiori is also festive during this time. Hanukkah falls during a different week each year, sometimes even happening in late November, so make sure you check the dates before making holiday plans. Christmas Markets in Rome: From early December through January 6, visitors will find festive markets in Piazza Navona filled with people in stalls selling handmade gifts, nativity crafts, children's toys, and seasonal treats. Nativity Display: 100 Presepi, a display of nativity scenes from around the world, is found at Sala del Bramante near Piazza del Popolo through January 6. Nativity displays are also set up in most of Rome's churches if you're planning on attending Mass or service. Immaculate Conception: On this holy day, December 8, the Catholic faithful celebrate the day of the Virgin Mary's conception of Jesus. Traditionally, the Pope celebrates this day by leading a caravan from the Vatican to Piazza di Spagna, where he lays a wreath at the Colonna dell'Immacolata in front of Trinita dei Monti Church. Saint Lucy's or Santa Lucia Day: While the feast day of Santa Lucia (December 13) is more widely celebrated in Sicily, in Rome, it is observed with a large procession from Castel Sant Angelo to Saint Peter's Square. Christmas Eve: Along with being a time to spend with family, Christmas Eve (December 24) is also the night when nativity displays are traditionally completed by adding the baby Jesus or are unveiled in their entirety, such as the life-size nativity in Saint Peter's Square. Christmas Day: You can expect everything to be closed on Christmas Day (December 25) as Romans celebrate one of the most religious holidays of the year. Of course, there are many ways to celebrate Christmas in Rome, from attending midnight Mass at Saint Peter's Basilica to visiting Christmas crèches around the city. Saint Stephen's Day: This public holiday is observed on the day after Christmas (December 26) and is typically an extension of Christmas Day, when families venture out to view nativity scenes in churches and visit Christmas markets. The feast day of Santo Stefano also held on this day, is celebrated at churches that venerate Saint Stephen, such as the church of Santo Stefano Rotondo near the Colosseum. New Year's Eve (Festa di San Silvestro): Just as it is all over the world, New Year's Eve in Italy (December 31), which coincides with the Feast of Saint Sylvester (San Silvestro), is celebrated with much fanfare in Rome. Piazza del Popolo holds Rome's largest public celebration with music, dancing, fireworks, and of course, huge crowds. Before you book your plane ticket, it's important to note that December 8, 25, and 26 are national holidays in Italy, so you should expect most businesses, museums, and other government facilities to be closed. Since you can typically experience autumnal weather throughout the month but it's also the beginning of the off-season for tourism in Rome, December can be an ideal month to visit the city. You won't have to fight nearly as many crowds but will still be able to enjoy the many outdoor attractions of this ancient city. Hotels and travel costs should be reduced this time of year, especially if you're traveling earlier in the month. However, since Christmas is one of the most important holidays in the country, prices usually spike during that time until New Year's Day.